Brother Jesse Blog: TWEETING FOR THE MILLION MAN MARCH: Twitter users tune into Minister Farrakhan's address in Memphis via online webcast. TWEETING FOR THE MILLION MAN MARCH: Twitter users tune into Minister Farrakhan's address in Memphis via online webcast. Twitter users from across the country and the globe took a break from watching football games to tune into the live webcast of the Honorable Minister Louis Farrakhan on October 18. Culminating a weekend of events, Min. Farrakhan delivered the keynote address commemorating the 14th anniversary of the Million Man March. The main story will be covered in an upcoming edition of the The Final Call newspaper by Assistant Editor Ashahed M. Muhammad. With the hashtag #mmm, Twitter started buzzing with anticipation as staff members from The Final Call Newspaper launched live tweets from the beginning of the webcast all the way until Min. Farrakhan closed out. 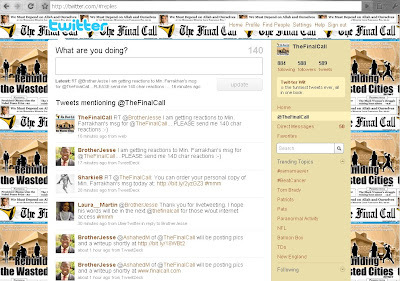 Tweets started streaming from @TheFinalCall, @BrotherJesse, @NisaIslam, @JasirX, @beansouptimes and more! Soon quotes from Min. Farrakhan started being retweeted along with dialogues surrounding some of his comments. Thank you to everyone who put the word out via Twitter! 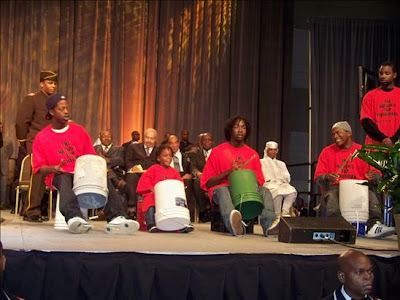 A special thank you to Final Call Staff Writer Nisa Islam for this exclusive photo of the Chicago based group The Buckets Boys, who performed in the pre-program in Memphis. The group works with NOI Top Fisherman Warren 2X. Modern means and methods!! Love it!! !